Bycatch: penguins can easily drown in nets designed to ensnare fish. Among the species under threat are Tasmania’s little penguins and New Zealand’s yellow-eyed penguins, as detailed in a review, published in the journal Endangered Species Research. The review shows the level of bycatch is of greatest concern for three species: Humboldt and Magellanic penguins, both found in South America, and the endangered New Zealand yellow-eyed penguins. On New Zealand’s South Island, yellow-eyed penguins are down to fewer than 250 nests. Previous population strongholds have declined by more than 75%. Conservative population models predict local extinction of yellow-eyed penguins by 2060, if not earlier. Penguins are among the world’s most iconic and loved birds, despite the fact that many people never get to see one in the wild. Indeed, the opportunities to do so are diminishing, with ten of the 18 penguin species threatened with extinction. After albatrosses, penguins are the most threatened group of seabirds. And, like albatrosses, bycatch is thought to be a serious issue for some species. On land, many penguins are now well protected, thanks to the efforts of conservation researchers, government agencies, community groups and tourism operators. Where many penguins were once vulnerable to attack from introduced predators, or to habitat loss from farming or development, today the biggest worry for many penguin chicks is how to get more food out of their parents. But below the waves it’s a different story. Over thousands of years, these keen-eyed seabirds have evolved to catch food in the depths, while avoiding natural predators such as seals and sharks. But they cannot see the superfine nylon fishing nets invented in the 1950s which fishers now set in penguin foraging areas. Little penguins, whose scientific name Eudyptula minor literally means “good little diver”, typically forage in the upper 20 metres of the ocean, with each dive lasting about 90 seconds. The larger yellow-eyed penguin – Megadyptes antipodes, the “big diver of the south” – prefers to hunt on the seafloor some 80-90m down, holding their breath for 2-3 minutes before coming up for air. If they do not encounter a fishing net, that is. Gillnets (also called set nets) in particular are very dangerous for penguins. These nets are set in a stationary position rather than being dragged through the water. They are designed to catch fish around their gills, but can just as easily snare a penguin around its neck. If it gets tangled in a net, a penguin will panic and drown in minutes. In Tasmania, nets with more than 50 drowned little penguins have been found washed ashore. Other penguins are found on beaches with characteristic bruising from net entanglement around their necks. Nets are deadly to little penguins. When a penguin is killed at sea, this has knock-on effects back at the nest. The chicks will die of hunger or fledge underweight, with little chance of surviving their first year at sea. The breeding partner left behind will probably skip a breeding season; some penguins never find another partner after losing their mate. I have seen them calling plaintively from their nest, or even going down to the shore in the evening to look out to sea, before returning to their nest all alone. In New Zealand, the endangered yellow-eyed penguin is declining. Current population models predict their extinction on the New Zealand mainland by 2060, or potentially even earlier. Yellow-eyed penguins are facing many threats mostly because they are simply living too close to humans. Whereas threats on land are reasonably well managed, threats at sea need urgent attention. Marine habitat degradation by industries that damage the seafloor will take decades to recover. Similarly, pressures from climate change will not have a quick enough fix to save yellow-eyed penguins from local extinction. There is one thing, however, we can change immediately: the needless death of penguins in fishing nets. This will give already struggling penguin populations a bit of a breather and maybe even the resilience required to deal with the many threats they face in their daily fight for survival. Judging by the number of penguins washed ashore with net injuries, many fishers simply discard penguins’ carcasses at sea rather than reporting bycatch or working towards solutions to mitigate it. Do we really want penguins to drown for our treat of fish and chips? Less destructive fishing methods are available that do not cause penguin bycatch and the death of other protected species. But these more selective fishing methods would require fishers to change gear, which costs money. Currently, there is very little legal or commercial incentive for fishers to do anything about penguin bycatch. But there are a couple of things you can do. Please do not just buy any fish with your chips – ask which species it is and how it has been caught. You can use a sustainable seafood guide, such as New Zealand’s Best Fish Guide or Australia’s Sustainable Seafood Guide. That way you can help the penguins snag a safe fish supper of their own. This newborn fiddler ray will be released back into the ocean. But will it survive? Rays are among the species most vulnerable to overfishing and are often caught incidentally in commercial trawlers and released as unwanted bycatch. Unfortunately, we’re probably underestimating the impact that fishing is having on ray populations. Although some will survive capture, we know little about the non-lethal and long-term effects of that stressful experience. Included in those unknowns are questions relating to reproduction. In particular, what if the captured ray was pregnant? Would she still give birth? If she did, would her offspring survive? Our latest research shows capture stress can reduce a mother ray’s body condition, and also affects the health of her offspring – in much the same way that stress during pregnancy can affect humans. The release of a southern fiddler pup (born in captivity) and its mother. This research focused on the southern fiddler ray (Trygonorrhina dumerilii), also known as the “banjo shark”, a species common in the coastal waters of southern Australia. Beyond just this species, our results suggest it’s possible that other ray and shark species that have live-birth (including most large sharks) could be similarly affected. All rays give birth to live young. For many species pregnancy lasts about a year, making them more likely to be captured during reproduction compared to egg-laying species. 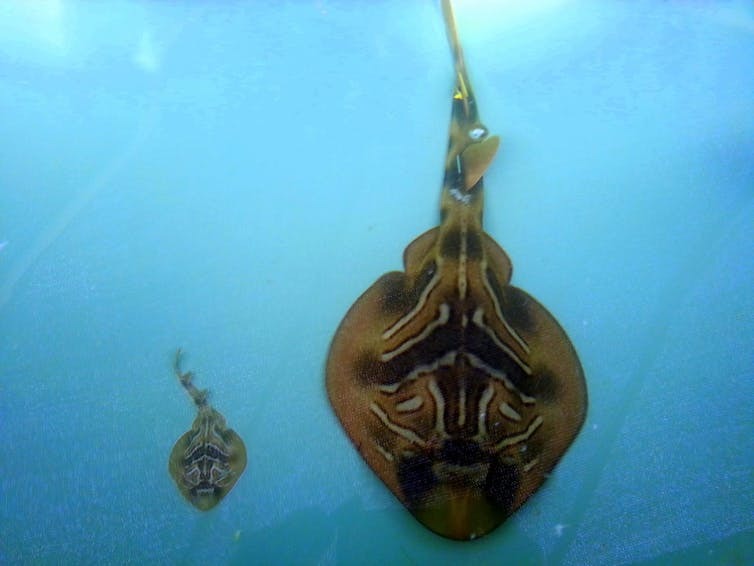 Pregnant southern fiddler rays were collected by hand in Swan Bay, Victoria, Australia, using SCUBA to minimise stress during collection. They were transported and housed in our “maternity ward” – a large outdoor research facility located nearby. Ultrasound of pregnant female showing southern fiddler embryo in utero. Our maternity ward included a large tank equipped with a giant paddle that pushed water past stationary nets, thereby simulating a trawl net being dragged by a boat. Rays were placed in these nets and trawled, followed immediately by 30 minutes of air exposure to replicate the process of sorting the catch on board a boat. A similar number of control females were kept in a separate tank and were not subjected to trawling or air-exposure. Over the next three months, pregnancy and the health of each mother was regularly monitored via ultrasounds, blood-sampling and weighing. At birth, their pups were also measured for length, weight and had their blood sampled. Mothers carried and gave birth to an average of two pups. Pups from trawled mothers were 12% shorter and 27% lighter than those from untrawled mothers. 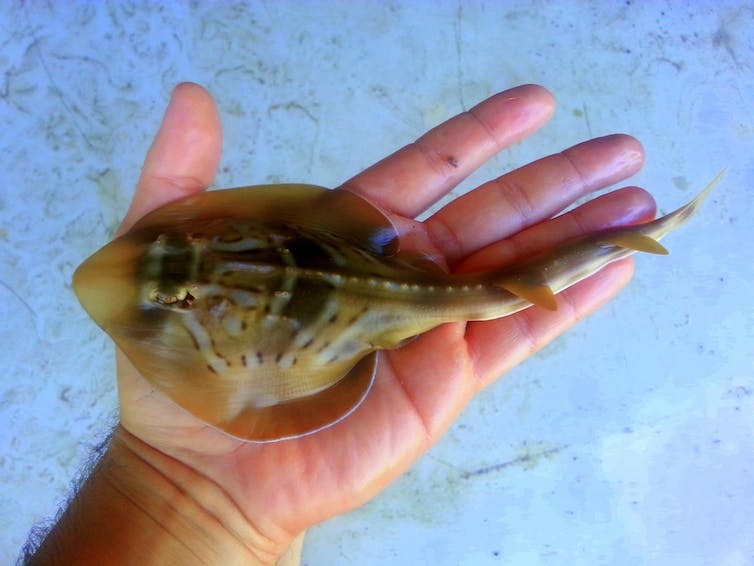 A baby southern fiddler ray is released. In most animals undersized offspring generally have a lower chance of survival. Marine predators are often restricted in their options of potential prey by the size of their mouth, with smaller animals more easily consumed. Lower body mass may mean pups have fewer energy reserves – in the form of an internal yolk sac – to rely on. An increased risk of starvation is possible during the early stages of life when inexperience can make catching prey difficult. Pups from trawled mothers also showed signs of a stress response in their immune system, and increased vulnerability to infection and disease is possible. The increased energy needed to maintain a healthy immune system may also limit growth rates. This is important for female fertility because larger females tend to carry more offspring. Trawled mothers showed indicators of stress for 28 days after trawling, exhibiting elevated immune responses and 9-15% lower body weights compared to their unstressed counterparts. Southern fiddler ray mother and offspring in tank. Reduced body condition after giving birth could mean that the next mating event may be delayed or missed in order to rebuild sufficient energy stores for a successful pregnancy. Delaying or missing mating opportunities could be particularly important for other live-bearing species like the scalloped hammerhead (Sphyrna lewini) and sharpnose sharks (Rhizoprionodon taylori), which mate again shortly after giving birth. By examining the non-lethal responses to capture stress, we’re working towards more efficient fishing practices that improve conservation outcomes for marine species. A simulation of how bottom-trawling nets operate at sea. Regarding reproduction, it may mean that we can better assess and manage fishing practices in areas where sharks and rays are known to congregate and breed. Fishing techniques that reduce the amount of accidental capture of rays and sharks will benefit both fishermen and conservation efforts, especially during vulnerable breeding periods. For example, “turtle exclusion devices” in trawl nets (originally designed to prevent the capture of sea turtles) allow animals that are much bigger than the target catch to escape through a chute. Such a device may be suitable for reducing shark and ray bycatch too. How a turtle exclusion device (TED) works. Our study into how capture affected pregnancy in rays is part of a larger research program led by Monash University in collaboration with Flinders University, University of Tasmania and the Victorian Marine Science Consortium. The research program’s results on both lethal and non-lethal outcomes of capture have helped inform the Australian Fisheries Management Authority (AFMA) how to fish for the future and improve the conservation of sharks and rays. The World Wildlife Fund (WWF) recently raised over A$200,000 to buy shark fishing licences in Queensland’s waters. They estimate the licences, for operating nets in and around the Great Barrier Reef Marine Park, could have been used to catch 10,000 sharks each year. Retiring these licences is a new development in Australian shark conservation, but may also limit locally caught seafood. Globally, there is great reason for concern over the status of sharks. About a quarter of all sharks and rays are threatened with extinction. The high value of shark fins in Asian markets drives a large and often unsustainable shark fishery that reaches across the globe. Australia has an important role to play in combating this trend. Many species that are globally threatened can find refuge in the Great Barrier Reef Marine Park, which has an extensive system of protected areas and comparatively low fishing effort. Despite this potential safe haven, some species in Australia still rest on an ecological knife edge. A white-tip reef shark in the Great Barrier Reef Marine Park. For example, the great and scalloped hammerheads (which the WWF says will benefit from the licence purchase) are both by-catch species in the Australian fishery and are listed by the International Union for Conservation of Nature as endangered. Australian fishermen don’t head out to catch hammerheads intentionally; most people do not consider the meat palatable. However, their hammer-shaped head is easily entangled in nets. Therefore hammerheads may be highly susceptible to any increase in fishing pressure. Commercial fishers are legally required to have a licence. By buying the licences, WWF can limit the number of active nets in the water. However, not all shark species are as vulnerable to fishing as the iconic hammerhead. Several shark species in Australia are well-managed. For instance, the spot tail shark is fast-growing and has many young, making it relatively resilient to fishing pressure. Many Australians regularly enjoy these species with a side of chips. Species targeted by Queensland’s shark fishery are likely sustainable. The latest fishery assessment published by the Queensland government in 2014 found that catches of most shark species were well within safe limits. Supporting our local shark fisheries is therefore far better than importing shark from overseas where fisheries may be poorly managed. But it is not all good news in Australia. Both the assessment and an independent review found that while Queensland’s shark catch likely is sustainable, we need to be cautious about allowing any increases. Importantly, Queensland’s 2014 shark assessment relies on very limited data. A crucial fishery observer program was cut in 2012. The limited data mean that regulations for Queensland’s shark catches are set conservatively low. Any increase in catch is risky without an assessment based on higher-quality data. Scientists use tag-and-release programs to track the movements and population size of sharks. But more direct fisheries data are needed. Buying up licences in an uncertain fishery may be an effective way to prevent the decline of vulnerable species. Although buying licences is a new move for marine conservation groups in Australia, elsewhere it has proven an effective strategy for conservation and fisheries. For instance, in California the conservation group Nature Conservancy bought fishing licences for rockfish, some species of which are endangered. The Nature Conservancy now leases those licences back to fishers that promote sustainable fishing methods. The fishers themselves can charge a higher price for sustainable local catches of fish. What started as a move purely for conservation has had benefits for those employed in fisheries. The lesson here is that conservation organisations can be the most productive when they work with, not against, fisheries. The recent shark licence purchase in Australia could be a great opportunity for fishers and conservation organisations to work together to maintain healthy ecosystems and fisheries. But if Australians are serious about protecting sharks, there are other steps we still need to take. Queensland should reinstate the fishery observer program so we have reliable data to assess shark populations. For instance, currently we don’t know how many sharks are caught as by-catch in other fisheries. A lemon shark seeks its fish prey in the shallow waters on Australia’s Great Barrier Reef. Lemon sharks are caught by our fisheries, but are not a target species. 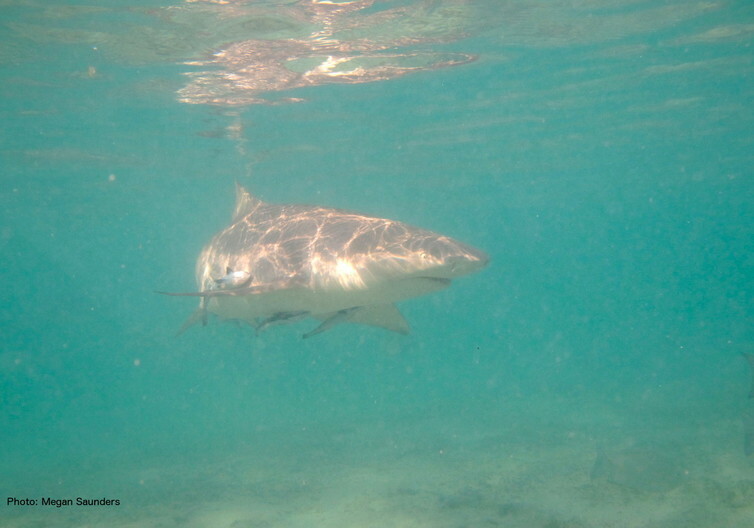 Shark control programs designed to protect bathers are also a threat to endangered shark populations. However, data on deaths from shark control in Queensland were not accounted for in the government’s catch limits. Accounting for these missing deaths could make a serious dent in our sustainable catch, an independent review found. There is an opportunity to address these issues in Queensland’s upcoming fisheries management reform. Have your say here. If conservation groups can work with fisheries, a more consistent and sustainable shark-fishing strategy may emerge. Australians can continue to be proud of our efforts to protect marine life, but can still enjoy shark for dinner.